Content Warning: The Royal Tenenbaums contains a graphic scene of attempted suicide. Please take this into consideration when you watch. Back in August, the wonderful people at Criterion Blues, Speakeasy, and Silver Screenings announced the Criterion Blogathon, which simply asked participants to pick something (be it a movie, an actor, or a theme) from the collection and write about it. Last year, The Criterion Collection celebrated its 30th anniversary. You can also access quite a few of the movies on Hulu! And here’s one of my many favorite scenes, to give you an idea of the tone. So why is this my favorite Anderson film? Just look at that cast, for one thing. The performances in TRT are all top-notch, down to the children that portray a younger Chas, Margot, and Richie – they must have spent quite a bit of time with their older counterparts in addition to the strong resemblances. They also come across as tiny adults; they never really had a chance to be kids, which is reflected in how they end up as adults. You also have real-life brothers in the cast; Owen Wilson portrays Eli Cash, the Tenenbaums’ neighbor who might as well be a member of the family. Everyone makes their characters, who could very easily be caricatures, well-rounded people with quirks and foibles. TRT is presented as an adaptation of a book, with Alec Baldwin’s voice adding gravitas. This is one of the things that makes the film stick out for me; without the narration, it would be a hugely different film. Without it, we would lose a lot of insights into the characters and their backgrounds. It doesn’t feel like exposition, but more like a hybrid of an audiobook and a film. The script was nominated for best original screenplay, and its well deserved. Anderson has a distinctive filmmaking style. Almost all of his shots are straight on, with either no camera movement at all or simple panning. When they aren’t, it’s significant. It also jars you out of your comfort zone when what the camera has been doing all this time changes suddenly. There are also a lot of cutaways to static shots. For example, when the narrator tells us that Eli Cash had just finished his second novel, we cut to a collage of multiple copies of the novel. Touches like this make the story seem more real. 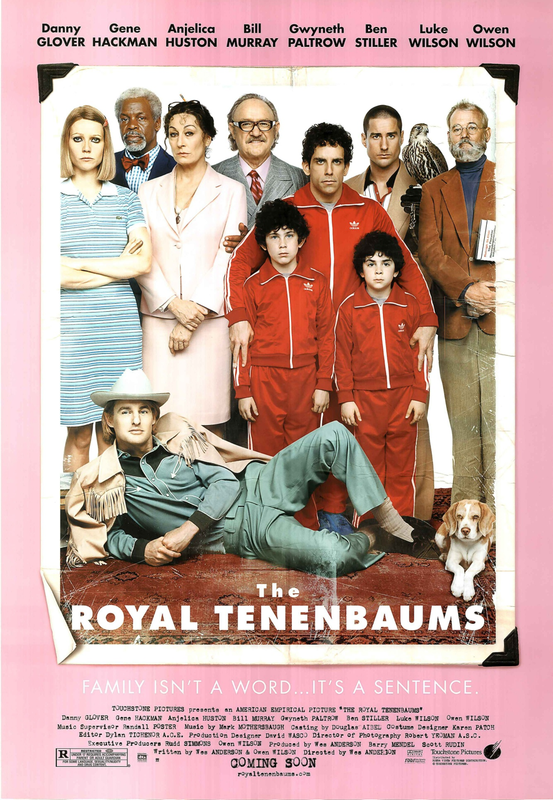 The Tenenbaum family saw its heyday in the 70s and doesn’t seem to have left it (just look at all their clothes and listen to the amazing soundtrack). At the start of the film, almost everyone except Etheline is in crisis mode. Royal is estranged, Chas’s wife died in a plane crash so he’s constantly worried about his and his sons’ safety, Margot is in a holding pattern with a much-older husband she doesn’t seem to love, and Richie’s career as a tennis champion was abruptly ended because of a meltdown he had at an important match. Etheline, however, is an accomplished archaeologist whose accountant, Henry (Danny Glover), has finally gotten up the nerve to propose to her. They’re one of my favorite movie couples; you don’t get a lot of their history, but it’s very clear that they love each other deeply. Through various circumstances, everyone ends up living in the childhood home on Archer Street again. As the poster says, family isn’t a word, it’s a sentence – the film does such an amazing job portraying everything that being a family entails, from disagreements to reconciliation. I also think it contains incredibly honest depictions of depression and anxiety. A lot of people can relate to TRT; family and all that comes with it is one of the most universal themes you can explore. A word on the women in TRT, considering that we’re here on Nerdy but Flirty. Margot and Etheline are both wonderful women characters. They make their own decisions, often rebelling against the men in their lives, and are well-written and complex overall. Margot is bisexual and it’s presented without any of the unfortunate stereotypes that can happen in media. Her comfort with herself in her sexuality doesn’t make anyone condemn her, and she’s not the manic pixie dream girl that she easily could have been. Etheline is portrayed as the more stable parent, and she’s not bitter towards Royal whatsoever. The script treats its women well, which is much appreciated. Here’s the full listing of movies being covered and where you can find that coverage. 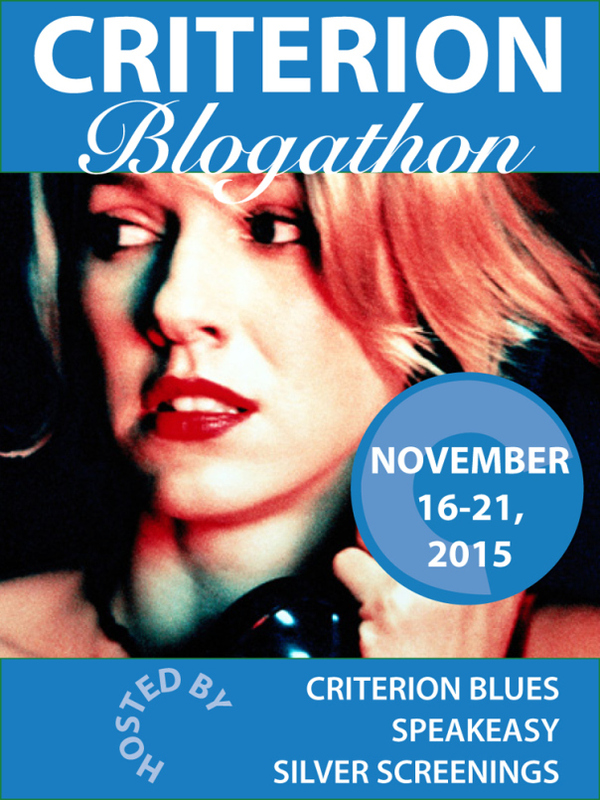 You can also check on Twitter under the hashtag #CriterionBlogathon. I hope you find something that sparks your interest! I love this movie, and Wes Anderson. It’s unfortunate that he’s such a polarizing director, because I think he does some really interesting things. I saw TRT way too young to fully understand it and although I didn’t see it for maybe 10 years after the first viewing, it really struck a chord. The suicide attempt scene remains one of the first cinematic images that ever stuck with me. Such an amazing flick. Fantastic contribution to the blogathon. Thank you so much for reading, Michaela! I think that this is the perfect starting point for watching Wes Anderson (probably because it’s how I was introduced to him, haha!) and it made me want to watch all the rest, even if I haven’t loved them as much. I still have a few to go though! Love this film so much, and I’m glad you mentioned the female characters. It’s one of the things that makes his films so refreshing, but I never really thought about it. The women are complex and unusual (yet relatable) and never seem like they’re there as decoration. I 100% agree! They’re just as weird as everyone around them, hahaha. You make a good point about the narration – it would be a much different film without it. Say what you want about Alec Baldwin, when he’s on, he’s ON. Loved your post. It’s been some time since I’ve seen this, but your descriptions made it fresh again. Thanks for bringing The Royal Tenenbaums to the Criterion party! Thank you so much for reading! I’m glad you enjoyed my post, and I really loved writing about one of my favorite movies. Wonderful post. I first watched TRT back when it came out, and this was a stylistic change in direction for Anderson. I admired it, but because he continued with a similar style. Consequently for me, this film has not stuck with me and I don’t appreciate it as much. Since Anderson has out some stunning work recently, it is time for me to revisit. Thanks for pushing me in that direction. I also agree that the female characters are strong. They aren’t always as well written, but when they are (like Suzy in Moonrise Kingdom), it really enhances the material. Thanks for participating in this Blogathon! Thank you so much, Aaron! I hope you enjoy it more upon revisiting. I haven’t seen Moonrise Kingdom yet and I’m really excited to! I look forward to participating in future Blogathons – this was really fun! It was great having you. I wasn’t familiar with your site, but I like the feminine pop-culture (or geek culture?) that you cover here.